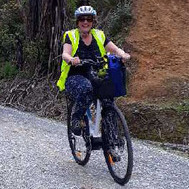 This photo was taken at the view point on highway 25 on the Coromandel Peninsula(going from west coast to east coast). 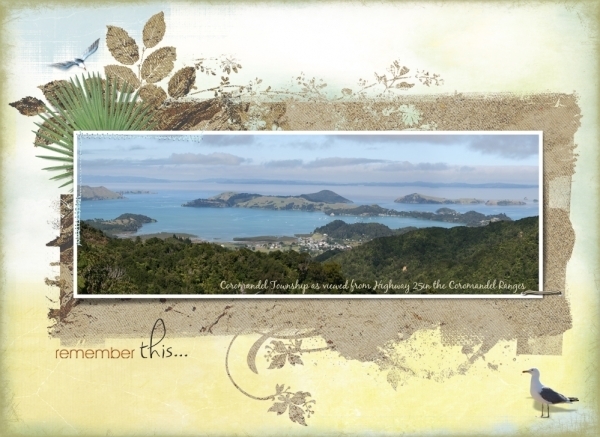 You are overlooking the township of Coromandel. Its a beautiful part of NZ and we were there last week and the waeather was perfect. Beautiful photo, and a great LO. Love it. Ohhh.. What a gorgeous scene and photo Jane and how beautifully you masked and scrapped it. I really like your soft edges and beautiful background blending and the seagull and title is just perfect. Lovely layout. What gorgeous scenery! Scrapped so beautifully, and the colors you use enhanced it perfectly. So beautiful. I like your soft natural background. Perfect for a mountain scene. Magnificent panorama! This photo makes me want to visit N.Z., which I know is beautiful. I love your treatment of the photo: the mask, the colors, the words, and especially the way the blended sea gulls frame the scene. Gorgeous, Jane! Gorgeous photo! I love how you've used the mask to frame it, too. The colors of your background - brown, yellow & the hint of blue set off your photo wonderfully. What a stunning page Jane! Fantastic photo, and so beautifully framed. I love the perfect mask and background and the word art/title is perfect too. Love it!! Beautiful photo Jane. What a spot of of paradise it seems to be. Your background is so lovely, the colors and blending, and especially the seagull! Beautiful photo and the placement of the embellishments all around and behind it are wonderful.